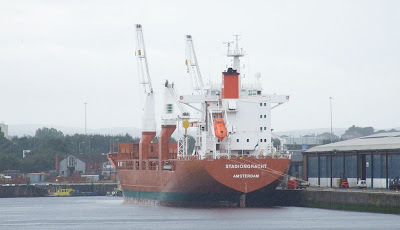 Spliethoff's STADIONGRACHT was noted discharging plywood in King George V Dock yesterday, and she sailed early this morning for Southampton. She is one of the company's ships that was built in Poland, by the New Sczeczin Shipyard, and was launched in 2000. She is 16,641 gross tons. This particular vessel is one of the ten-strong 'S' class, six of which were built in Japan (by two different yards), and the remainder at Sczeczin.